A versatile, refreshingly simple and powerful board, full of decent staple sounds at a reasonable price. Very portable. Full of quality sounds. Intuitive and easy to use. Effects control is a little limited. Only two audio outputs. Needs a waterfall-style keybed. 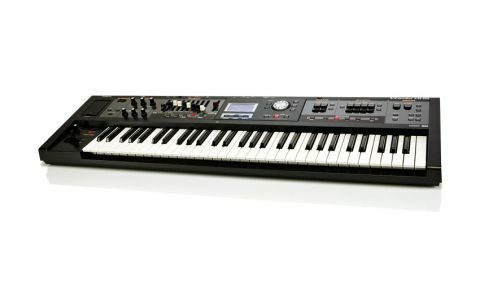 The Roland VR09 is impressively portable at just 12lbs (5kg) and can also run on batteries. Build quality is good for the money and the dials and switches have a solid feel. The keybed has a fast and shallow key travel which is great for synth/organ sounds but it sadly has no aftertouch and isn't ideal for playing piano or doing organ palm slides due to the diving-board-style keys. A waterfall-style keybed with aftertouch (like the VR760) would have been much better. "Everything is laid out logically and it's extremely intuitive"
Everything is laid out logically and it's extremely intuitive, allowing you to concentrate on playing rather than menu diving. First there's a USB stick slot for storing sounds/registrations and playing back MIDI files, WAVs, AIFFs and MP3s - great for practising/playing along with and for solo performers. Next are six real-time effect dials for controlling overdrive, tone, compression, master effects (20 types) plus delay and reverb. These allow you to quickly tweak the main effects, again keeping performance in focus. All of the seven effect types can run simultaneously and sound clear, warm and musical. Highlights include the slicer, tape delay, mod-delay and dual-rotary emulation. Our only criticism is that the reverb, delay and overdrive don't kick in until the corresponding effect dial has been turned through a quarter of its travel, so it's harder to get just a dash of an effect on a sound. Also, deeper editing of the effects is severely restricted, though the synth and organ sections can be edited in detail using the VR09 iPad editor, plus the MFX dial controls multiple FX parameters at once. The comprehensive organ section offers Jazz, Rock and Transistor models. These sound nicely authentic and much like the well-regarded VK8, plus the drawbars can also control the synth amp envelope and filters as a bonus. Using the tone and overdrive controls really helps to bring the organ sounds to life and the great sounding rotary sim is available to all the other sound sections. The chorus/vibrato is also decent, though the percussion gets processed by the chorus/vibrato unit (which is not authentic to a real Hammond B3) and this causes percussive sounds to lose punch. However, the organ can be split/layered with itself or other sounds and as a bonus you can control the lower manual from an external MIDI controller keyboard, plus there's a pedal board connector. "Deeper synth editing is easy if you have an iPad with the VR09 editor"
The piano and synth sections can also be split/layered and it's easy to set up a piano on the VR09 keyboard and play a VR09 synth sound from an external MIDI board at the same time, though currently the expression pedal only works on both layers simultaneously. The acoustic piano sounds are solid too (GrandpianoV is our favourite) and whilst the EPs have a generally authentic tone, they are slightly let down by some velocity jumping between the sample layers. The synth section sounds excellent and uses the same warm and punchy 'Supernatural' engine as the Jupiter 80/50/Integra7, though onboard editing is restricted to just envelopes and filters. Thankfully, deeper synth editing is easy if you have an iPad with the VR09 editor. The drum/looper sections are also handy, though the current drum samples are fairly pedestrian. More importantly, the VR09 is half the price of a Nord Electro 4 or Hammond SK1 (though a similar price to the Korg Krome 61) and yet offers much of the functionality. It houses some excellent sounds and effects, real drawbars, it's simple to use with no menu diving and the versatile split/layer functionality means it can be the central board in a studio and live set-up for both pro's and beginners. There are some minor downsides as already outlined (and only two audio outputs) but it's still a must check out at this price. Hopefully Roland can address the small issues with firmware/ OS updates, then potentially this could be the live performance board of choice for many players, especially if they offer weighted and waterfall key models.